On my amazingly slow slog to 300 species in Queens there are some birds that I just can’t believe that I had never seen in my home borough. Long-eared Owl was not one of them. Enigmatic, reclusive, and camouflaged are three adjectives that work especially well with Long-eared Owl. Add to that the fact that only two Long-eared Owls have been reported to eBird in Queens since 1990 and you can see why the fact that Asio otus has eluded me in New York City’s finest borough is not shocking to me. That is why I was very happy to get an email Sunday evening alerting me that a Long-eared Owl had been reported from Queens to eBird. Finally, my chance! I contacted Derek Rogers, the reporter of the bird, and he gave me directions. I had to leave early for work on Monday morning anyway so I just left a little bit earlier so I would have a chance to stop by Forest Park, find the bird, and still get to work on time. I just needed the predicted rain to hold off long enough after sunrise to allow me to find the owl without getting soaked to the skin in my business attire! Monday dawned cloudy and cool but not yet rainy. 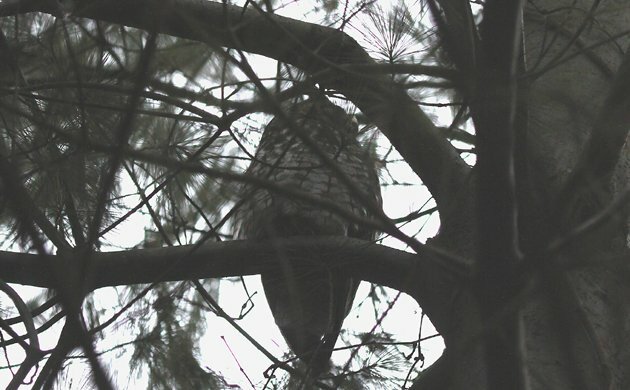 I drove to Forest Park, walked to the pine grove the owl had been reported roosting in, and found the bird! Yes! Number 298 in Queens! Here is the horrible image again, just because it seems right. Good bird, bad light. Two to go before I reach the magic 300 mark. I wonder what they will be? Hi … I think we seen some type of owl, today on this snowy day Beautiful in Jackson Heights NY. last night i went to my fire escape to open up the window and i see a big figure staring back at me with yellow eyes! it was an owl! this was also in jackson heights, queens. i believe the owl was dark with some white feathers in its bodice. i got scared! it was staring right at me!